Industry 4.0 – is your business prepared for new challenges? More than 50% of IT system failures are caused by technical failure or human errors. Kentix offers you just the right monitoring solutions in order to avoid damage caused by these kinds of physical threats – all in one system, ingeniously easy. IT systems today depict all critical business processes. With the continuous progress of digitalization and the adjustment to industry 4.0, the importance of flawlessly running IT infrastructure is growing rapidly. Failures can quickly cause high cost and reputational damage. Early detection and the direct reporting of threats is essential to avoid such damage, especially since more and more compliance requirements demand appropriate precautions and actions in order to avoid liability issues. The use of a monitoring system for the detection of critical threats such as temperature, humidity, dew point, fire, power, movement and more, is part of the basic equipment of every IT environment today. Do you have the 360° view for server rooms and all critical systems? Learn how you can increase your IT availability with 360° environmental monitoring and proactively avoid failures in advance. IT security requirements concerning industry 4.0 are growing rapidly as the threat level is rising. Kentix system solutions integrate all the key trades that are necessary for an uninterrupted physical monitoring of the IT infrastructure. They meet compliance requirements with only one system and save up to 2/3 of the costs compared to conventional systems. Basic protection requirements, ISO2700x or §9 BDSG (Federal Data Protection Act) can be met cost-effectively. Due to the intelligent networking of the various sensors with the Kentix MultiSensor® technology, all major threats will be detected as well. 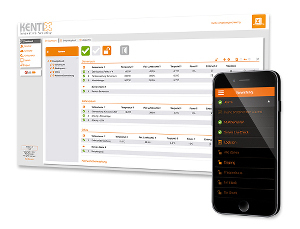 No more individual systems – save time and money with an all-in-one solution! No matter how small or large the application is – Kentix solutions integrate all critical systems, but require very few system components for a complete monitoring. That will save you costs – on the investment and during operation, especially since many single systems are not always compatible with each other and risk a smooth procedures. Physical hazards do not only threaten your IT! 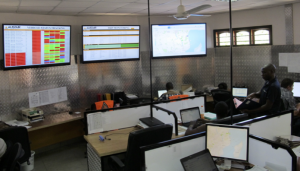 The African logistics company Alistair Group chose Kentix for the environmental monitoring of electronic data transmission control room. „Our Control Center IT is facing a big variety of risks here in Africa. In order to provide our customers with a 24/7 logistics chain, we must monitor all threats completely“, remarks Angelo Caruso, Operations Manager. Access control made easy: Existing doors can easily be rebuilt with the Wireless Door Knob and therefore made online-compatible. If required, IP cameras can also be integrated into the system and record a sequence of pictures with each attempt to unlock the door. IT racks or distribution cabinets can also be integrated into the online access system. If you are convinced now that your server room, your office and IT racks will be secured best as possible with our linkable online access control system, this is the direct way to our products.